The Model BX is a full featured, single channel, dual output vehicle detector that incorporates the reliable vehicle detection technology found in all of Reno A & E s vehicle detectors. All detector functions and settings are easy to configure using a set of eight external DIP switches and a simple to use eight-position rotary switch. Loop Frequency: Four (4) operating frequencies (normally in the range of 20 to 100 kilohertz) are selectable by means of two front panel mounted DIP switches. Sensitivity Boost: A front panel mounted DIP switch may be turned on to increase sensitivity during the Detect State. When a vehicle enters the loop detection zone, the detector sensitivity is automatically boosted to a higher level than the vacant loop setting. 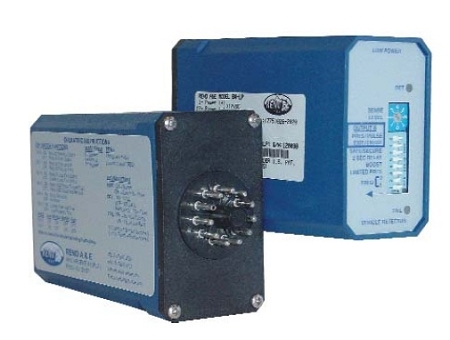 Presence / Pulse Modes: The detector output has two modes of operation that are selectable by means of a front panel mounted DIP switch; Presence and Pulse. (Pulse-on-Entry) or when the vehicle leaves the loop detection zone (Pulse-on-Exit). the output is being delayed. the detector is being supplied with a suitable level of power. rate with a 50% duty cycle indicates that the delay interval is currently timing. or the detector loses power. panel mounted pushbutton labled RESET. After changing the Frequency selection switches (DIP switches 1 & 2), the detector must be reset. Environmental & Tracking: The detector is fully self-compensating for environmental changes and loop drift over the full temperature range and the entire loop inductance range. Loop Inductance Range: 20 to 2000 microhenries with a Q factor of 5 or greater. Loop Input: Transformer isolated. The minimum capacitance added by the detector is 0.068 microfarad. Relay Output: Rated for maximum continuous current of 6.0 amps, 300 VAC maximum, 150 VDC maximum, and 180 Watts maximum switched power. Power: 120 VAC version (AX-3): 89 to 135 VAC, 4 Watts maximum. 240 VAC version (AX-8): 180 to 270 VAC, 4 Watts maximum. 12 VDC / 24 VDC / 24 VAC version (AX-4): 10 to 16 VDC, 80 milliamps maximum / 20 to 34 VDC, 50 milliamps maximum / 18 to 32 VAC, 4 Watts maximum. on both sides and plated through holes. Circuit board and components are conformal coated with polyurethane. Product worked great and it was received quickly. Would recommend if this is the product you need. Great item fast shipping and exceptional customer service. I highly recommend this product and of course gateopenersunlimited for your future purchases too. Thanks again!